The breed tract is Rohtak,Hisar and Jind of Haryana.The breed characterstics are massive body, neck and head comparatively long, horns short and tightly curled, Udder well developed, hip broad and fore – and hind quarters drooping. The tail is long reaching the fetlock s. The colour is usually jet black, with white markings on tail, and face and extremities sometimes found. The bullocks are good draught animals though slow and powerful. The average milk production per lactation is 1,500to 2,500 kgs. and the heretability of this trait is 0.2-0.3.The age at first calving is 45 – 50 months in villages but in good herds it is 36 – 40 months in intercaliving period is 450 – 500 days. 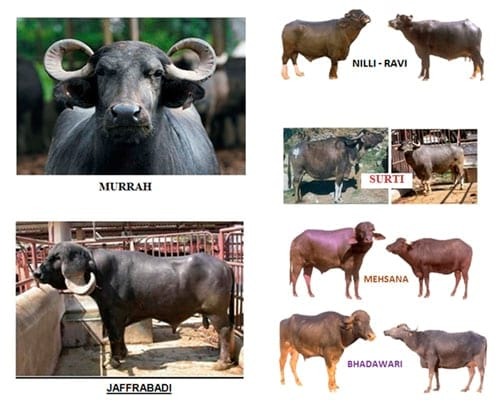 Surti : The breeds tracts of this breed is Kaira and Baroda districts of Gujarat. The body is well shaped and medium sized. The barrel is wedge shaped. The head is long with prominenet eyes.